Painted a beautiful Gray and is slick and straight. Chassis is boxed, Rootlib 3 pcs hood. Steel shell with stainless grill, stainless front spreader bar with turn signals, rear spreader bar is stainless. Tail lights recessed, steel tank painted to match car, boxed aftermarket chassis, cowl vent, Boss Motorsports rims are chrome with Radial tires, chrome front sway bar, chrome tie rod ends, front disc brakes with polished Wilwood calipers, Polished disc brake backing plates, upper and lower control arms are polished. Chrome Rack & Pinion rack, coilovers front & rear, stainless braided brake lines front & rear, 4-Link rear, 9" Ford with drum brakes. A real beauty and an attention getter! Beautiful Red interior on bucket seats, custom door panels and back panel, custom polished door handles, Lokar shifter, custom polished Wings gauge cluster with Whiteface AutoMeter gauges, polished column with polished drop, Billet Specialties half wrapped Red leather steering wheel polished. Billet tilt and turn signal knobs, Billet head light knob, Billet rearview mirror, Lokar gas pedal polished custom brake pedal with pad to match gas pedal, seat belts, kick panel and firewall custom 1 piece made. Red carpet, polished sill plates. Custom Red carpet floor mats to match carpet. Custom made column cover pad, trunk finished out and boxed in to match inside of car. Battery located in trunk. Beautiful inside. Powered by a 350 engine with a 350 Turbo transmission, Team G aluminum intake, Holley carb, chrome water neck, chrome water pump, Billet pulleys, chrome alternator, aluminum heads, chrome fuel pump, aluminum radiator, electric fan, stainless overflow tank, Billet wire covers, stainless headers, Lokar oil stick, Lokar transmission line, Billet air cleaner, Chevrolet valve covers painted orange, stainless polished exhaust with polished Magno Flow mufflers and stainless tips, power brake booster, chrome dust cover, Mr. Gasket chrome oil pan, mini starter, braided fuel lines. Runs and handles great! 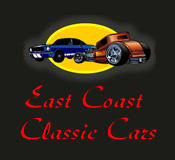 Visit our website at www.ecoastcc.com for more info.